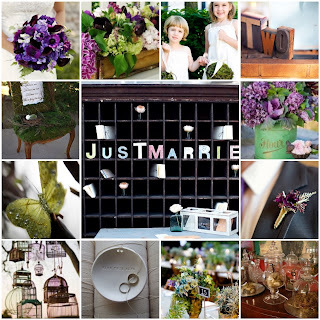 Marti's Floral Designs: This weeks Inspiration Board~ "Purple Romance"
This weeks Inspiration Board~ "Purple Romance"
During this busy booking season, I have already been inspired by many stylish clients. I love when clients give me a little more creative elbow room. I absolutely love when people step outside of the box. Different textures and colors always stand out. Sometimes the cheapest detail can be the most eye catching. Over the next couple of weeks I am going to do some inspiration boards for some of my favorite color combos mixed in with some fun detailing. Hope you enjoy!